You Are Trapped! You Have 60 minutes And One Goal: Escape Before Time Runs Out! Have you ever wondered what it would be like to be an Adventurer like Indiana Jones or a Tomb Raider like Laura Croft? Or maybe how it would feel to be trapped in a horror movie like Saw or Silence of the Lambs? Could you escape a maximum security prison or survive a night in a Haunted Asylum, or break into a bank vault to steal a priceless jewel without setting off the alarms? Here's your chance. Experience it all at one of the newest attractions in downtown Baton Rouge, 13th Gate Escape. 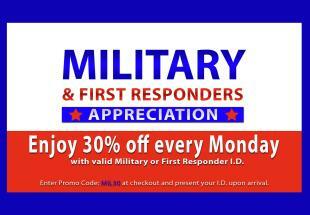 Every Monday at 13th Gate Escape is MILITARY MONDAY!